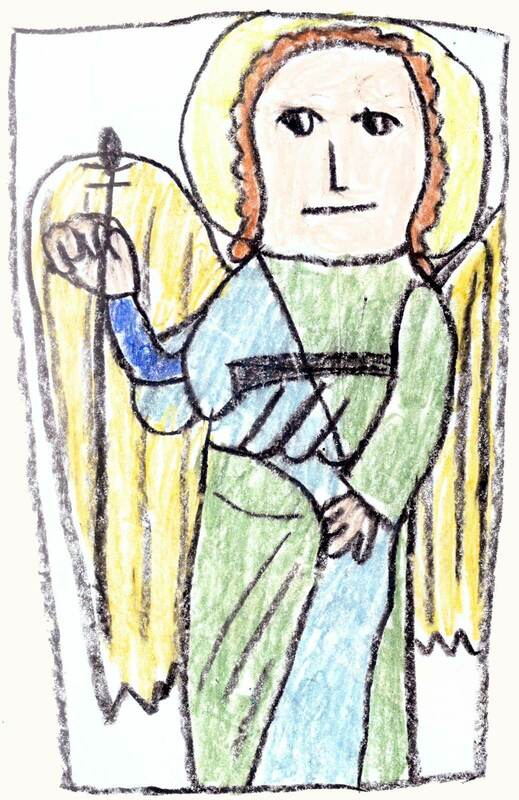 A drawing by one of our children of the Archangel Michael. We are a Christian mission (church plant) in Saint James, Missouri as part of the canonical Orthodox Church in America and the Diocese of the Midwest. A drawing by one of our children of a Liturgy during the week of Pascha (Easter). You may have read an article about us in the Rolla Daily News when we first started the mission effort, or you may have met us at the Celebration of Nations over the past few years. We are a growing and diverse group of people, usually outnumbered by our kids at any given service. We were selected to receive a mission planting grant in 2017. We work to be good stewards of it through practicing authentic generosity, love for God and each other, and by warmly welcoming every person God brings to us. We host a free retreat every fall, open to the public, where we invite a speaker to talk about a different aspect of the spiritual life. We are supporters of Guiding Star in St. James, the Free Women’s Center in Waynesville, G.R.A.C.E. in Rolla, as well as the Orthodox Christian Mission Center, and most recently sent a missionary to Montana to assist on the Blackfeet Native American reservation. Our purpose as Orthodox Christians is ultimately “theosis”, or union with God. We are called to become, to make, and to grow disciples of Jesus Christ by announcing His love for everyone around us, and by inviting them into communion with Him through repentance. Fr. Joel is from Crawfordsville, IN. Originally part of the Baptist Church, his family joined a national house-church movement called the Evangelical Orthodox Church. In 2002 their entire community was brought into the Orthodox Church in America. We operate under the blessing and direction of His Grace, Bishop Paul and the Holy Synod of Bishops of the Orthodox Church in America. Our people come from various backgrounds and share a variety of gifts within our community. Since being established in 2013 in Rolla, we’ve been hard at work praying and building. You can read more about our history, vision, and goals here.